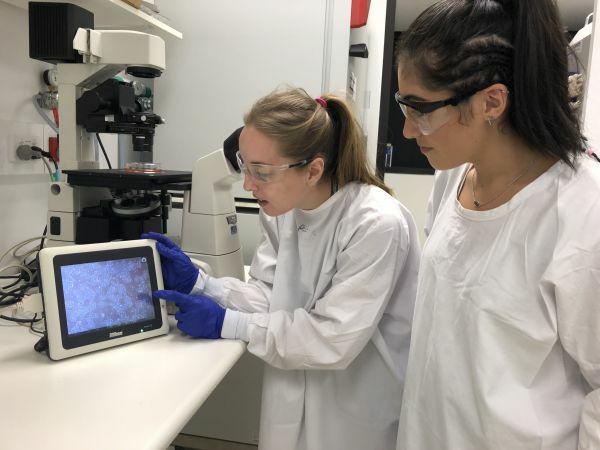 The Wells Laboratory hosted undergraduate student Gabby, giving her a valuable insight into how researchers go about investigating neurodegenerative disease, its causes and its potential treatments. Gabby initially spent time with Dr Matt Rutar to understand his research into disorders that affect the retina of the eye. Matt is a team leader at the Centre for Stem Cell Systems with expertise in retinal degeneration and neuroimmunology. Matt explained data processing of images taken in the lab for the identification of different immune cell types and their response to retinal damage. Matt also explained the importance of animal models in cellular research and took care in discussing the key ethical considerations of animal research. In addition to developing her skills in data analysis, Gabby worked closely with Nadia Rajab who is a PhD student at the Centre. Nadia provided training in stem cell culturing, enabling Gabby to develop her skills in this area. In addition to carrying out stem cell work, Gabby was given the opportunity to carry out real time Polymerase Chain Reaction (PCR) on samples to analyse the effects of infectious agents on blood-derived cells. Lastly, Gabby spent time with Josh Kie to observe how cells are characterised through a process called flow cytometry. “The week of lab experience was an excellent chance for Gabby to see how topics she had learnt about in school are carried out within the lab” said Nadia Rajab. Gabby will begin her first year of Biomedical studies in March 2019 and would like to personally thank both Nadia and Matt for this unforgettable, educational opportunity.